With the introduction of the Director a high-quality DAC (Digital to Analogue Converter) designed to deliver superior audio performance from digital sources such as media players, CD players and computers, Meridian delivered a product we can all enjoy. The 'Explorer' now takes this to an even more affordable level and brings 'streaming' into the realm of the high end. Explorer2 differs from it’s predecessor with the edition of Meridian’s 'MQA' – Master Quality Authenticated – a revolutionary, high end digital file format, yet is one that is small to download and stream. ’Music streaming’ as a way of listening to music was really refined by HRT (High Resolution Technologies). None could be better placed than Meridian to provide an even higher performing solution. So let us distill exactly what the Explorer is and what it does. If your computer/laptop is your primary storage and source of music (or at least one of), then you’ll want to get good sound from it. When plugged into your computer Explorer effectively replaces the function of your computer’s sound card – which are invariably less then perfect for reproducing quality audio. 'Jitter' degrades sound. Jitter is digital timing errors so circuitry that improves on timing errors results in more accurate sound. The timing circuitry in Explorer is very high quality so with it your music will sound clearer, cleaner and fuller. And it’s not subtle either. The improved performance, and the listening enjoyment you’ll get, makes the Explorer a worthwhile investment. The easy to use Explorer simply plugs into a USB socket on your computer with the supplied cable. This connection also provides power to the Explorer and firmware upgrades. For Apple users no set up is required. For Windows a driver can be installed from the Meridian website. Once connected all you need to do is select the Meridian Explorer DAC as the audio output in your computer settings. There are two outputs, one is a 3.5 for headphones and the other is dual purpose in that it can either be a 3.5 analogue or a digital optical output. The Explorer will therefore appeal to those of you who are 'desktop listeners’ either through headphones or an audio system. The Explorer is an amazing piece of technology – not that we would expect anything less from Meridian! The ergonomic design is small and light weight yet houses a 6 layer circuit board within the sturdy aluminium enclosure. Meridian say 'Most DACs simply alter the digital signal going into them, so the quieter you listen, the lower the quality. Explorer uses an analogue volume control, driven from the operating system, so you always enjoy the full digital resolution.' Like us, if you’ve had experience with DACS you know this rings true. Which DAC is for you…? Aside from differing performance levels DACs fall into varied types basically depending on their in–puts and out–puts, i.e. what you can do with them. 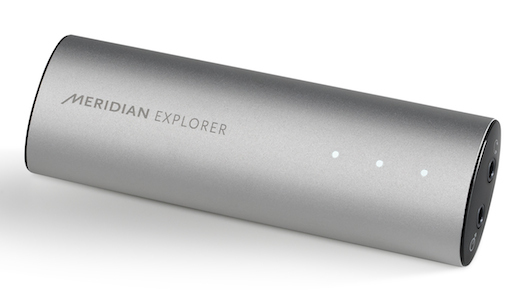 Explorer falls into the category of USB DAC with a headphone out–put. Of this sort we recommend three – in nice easy steps. NuForce’s uDAC is the most affordable without lacking in sound quality and features – it has it’s own volume control. From here you can make quite a big jump up in musical delivery by going to the MicroStreamer by HRT. After that the Explorer which is the best of the three. It boasts the highest resolution available on the market which can be heard in it’s much smoother sound. As discussed earlier the addition of any of these three will give you much more enjoyable listening from your computer knowing that in terms of performance you won’t regret going for the better option if you can. Meridian is based near Cambridge, UK, and was founded in 1977 by Bob Stuart and Allen Boothroyd. With over 35 years history of innovation and development of uncompromised consumer home entertainment systems offering exceptional performance, this award-winning company is widely recognised as a world leader in high-quality audio and video reproduction. Meridian developed the first audiophile CD player, the world's first consumer digital surround controller, and the MLP lossless packing system included in Blu-ray Disc. The company's optical disc players, DSP-based loudspeakers, video projectors, and scalers are unique in the industry, maintaining a super-quality digital signal throughout the path from the studio to the home, using advanced digital signal processing to deliver both a sweet, natural sound and smooth, crystal-sharp images with true cinematic realism. In late 2008, Meridian acquired leading networked media server developer Sooloos, and today the Meridian Digital Media System offers a unique combination of superb digital audio quality with the world's most innovative, flexible and intuitive touch screen.